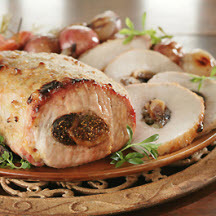 CooksRecipes has quality, kitchen-tested recipes for stuffed pork roasts and tenderloins that you can count on for successful deliciousness. This dish requires a bit of extra work, but with pre-packaged ingredients it goes smoothly. 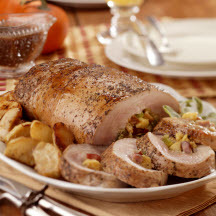 Recipe adapted from Bruce Aidells’ Complete Book of Pork, courtesy of Harper Collins Publishers. 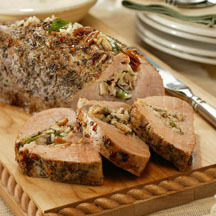 The holidays are a perfect time to serve this special stuffed roast.